Of course you recongnize those eyes, everybody knows that they are the ghosts eyes from the classic arcade video game Pac-Man. 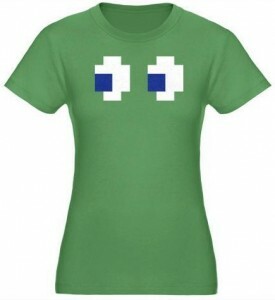 This is a true video gamer must have t-shirt, you can wear your favorite Pac-Man ghost with this 100% ultra-fine combed organic ring-spun cotton t-shirt, comes in classic enemy colors green, aqua or orange and in sizes Small to XL. Check out your Pac-Man Ghost T-Shirt.